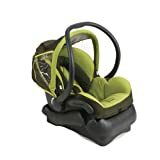 Mico Cosi Mico car seat is a seat you can easily use everywhere. Thanks to rigorous European and US standards testing, the sleek and brightly colored Maxi Cosi Mico car seat is known for its safety, surpassing US safety standards. Most people choose it for its safety features, including the padded harness and side impact protection, but also enjoy it’s ergonomic design and distinctive colors. The snugly padded seat also makes your baby feel safe and comfortable. Off its base, the seat is light and easy to carry around with its retractable carrier handle (4 different positions!). It also fits nicely into the Quinny Zapp stroller, which we use a lot. Snapping in the seat to the base in the car can be a bit tricky, but you get used to it. The Mico will carry your baby from five to up to 22 lbs and the shoulder harness, buckle and infant head cushion are all adjustable as your baby grows from infant to toddler. We also use the sun shade a lot where we live but it could ideally be a bit longer. The nice thing is the shade tucks away behind the seat when you don’t need it. When you’re on the go, the Maxi Cosi Mico is overall just an easy car seat to reckon with. $169.99 MSRP and 144.95 on Amazon. Moves in and out of car easily. Retractable sunshade tucks away easily behind the seat when you don’t need it. Snapping the seat to the base in the car can be a bit tricky, but you get used to it. The sun shade is good-sized, but could ideally be a bit longer.